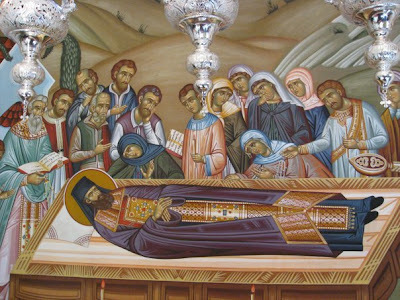 Below are excerpts and summaries from the life of St. George given in an excellent book: Precious Vessels of the Holy Spirit: The Lives and Counsels of Contemporary Elders of Greece, by Herman A. Middleton. Published by Protecting Veil Press 2003. 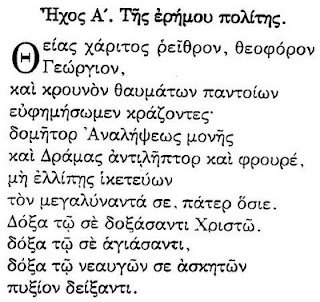 Because of the extremely difficult situations he was facing, at the age of seven Athanasios decided to run away, and was sheltered for awhile by some crypto-Christians. 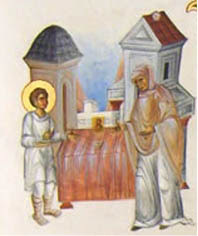 St. George the Great-martyr was a great protector of Athanasios, and he appeared to him, told him to mount his horse, and helped him to travel to Tiflis, Georgia where a pious priest took care of him. The priest was impressed by his spirituality and maturity, and clothed him in a cassock from age nine. In 1919 Athanasios was tonsured a monk with the name Symeon, and during his tonsure the bells of the monastery began to run by themselves. Fr. 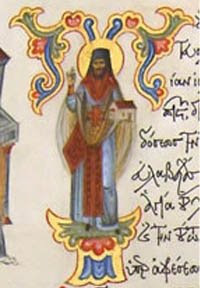 Symeon still faced many difficulties, however, as his monastery was soon closed by the communists, and the monks were humiliated, imprisoned, and threatened with execution. 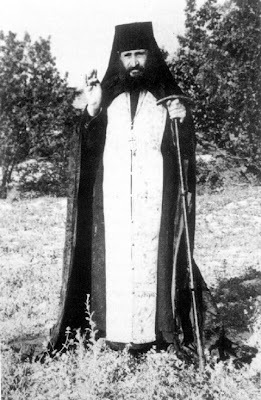 Once released from prison, he was ordained by Metropolitan John Tsiaparaski of Grouzia Scheta in 1925, and was given the new name George. He was recognized by many as being a God-bearing elder. Despite his difficult situations, he was constant in his ascetical struggles, eating mostly wild greens, sleeping little, and pursuing voluntary poverty (for example, refusing a new cassock to replace his old one which was falling apart). His service of the sacraments was filled with his love, care and attention. In 1929, most likely because of his failing health (not quite thirty years old and semi-paralyzed), St. George moved to Greece, and settled in the town of Sipsa near Drama in northern Greece. He gradually recovered with the help of the local inhabitants, who became aware of his holiness and sought his help. In 1936 the Elder went on a pilgrimage to the Holy Lands, where he met his uncle (who was a monk) who urged him to return to serve in the world, where there was a great need for spiritual guidance. Later, the Elder was given a plot of land by the Greek government, and in the year 1939, a monastery he founded and dedicated to the Ascension of Christ was consecrated. Many of the accounts of the counsels and miracles of St. George come from this later period of his life as the shepherd of the community of Drama. He forsaw both World War II and the Greek Civil War. During the civil war, three different groups of fighters went to slaughter the inhabitants of Sipsa, and they each felt intense remorse and apprehension and repented beforehand without harming the villagers. 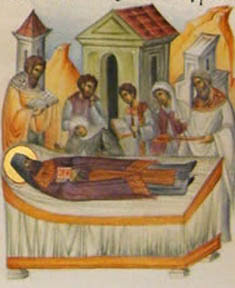 The Elder had forseen this danger, and instructed the inhabitants to have a procession around the village with the icon of Panagia. Thus the village was saved from certain destruction. In early 1959 St. George forsaw his upcoming death. As the day approached, he gave instructions to his spiritual children on his departure. 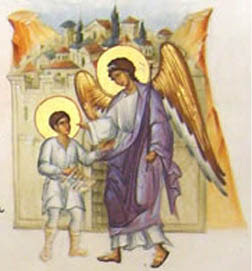 "On the eve of his repose he asked to be helped to go into the monastery church. 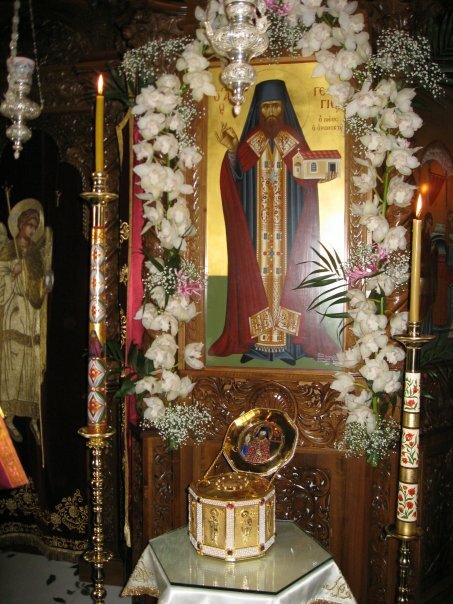 There he venerated the icons and partook of the Holy Mysteries one last time. A few hours after midnight on November 4th, 1959, St. George reposed in the Lord. Today a monastic community of nuns continue the spiritual legacy of St. George at the Monastery of the Ascension of Christ in Sipsa, Drama, in northern Greece. St. George has continued to work many miracles after his repose in the Lord. In 2008 St. George was officially acknowledged to be a Saint by the Ecumenical Patriarchate. Once again, many thanks to the author of the following book for translating the truly inspiring life of the newly-revealed St. George: Precious Vessels of the Holy Spirit: The Lives and Counsels of Contemporary Elders of Greece, by Herman A. Middleton. Published by Protecting Veil Press 2003. 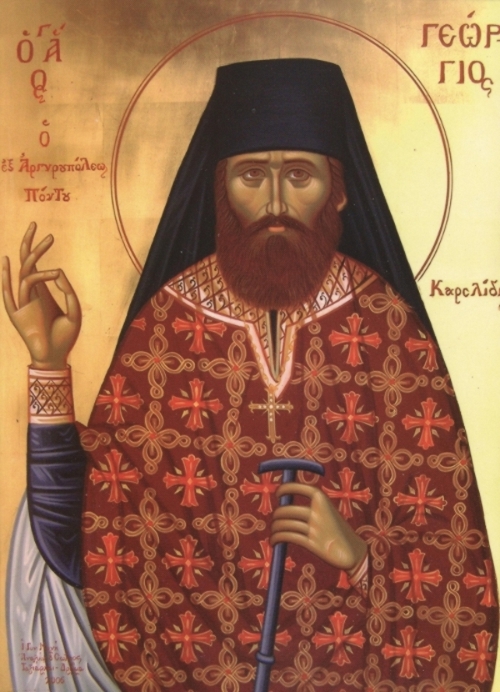 For a full biography and many stories and miracles from St. George, see: The Blessed Elder George Karslides (1901-1959), translated from the Greek text of Monk Moses the Athonite, by Orthodox Kypseli Publications. Also see: http://orthodoxwiki.org/George_(Karslidis)_of_Drama. For a few sayings by St. George, see: http://full-of-grace-and-truth.blogspot.com/2008/10/sayings-of-st-george-karslides.html. For a short video from his canonization service, see: http://full-of-grace-and-truth.blogspot.com/2008/11/numbered-among-saints-st-george.html. 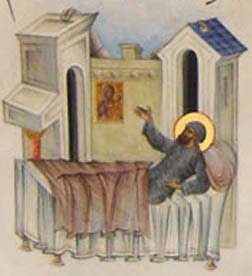 For the Paraklesis Service, along with Engomia of St. George (in Greek), see: http://www.pigizois.net/latreia/paraklitikoi_kanones/ag_georg_karslidis/par_kanon_ag_georgioy_karslidi.pdf. For a beautiful video of the Saint's Monastery of the Ascension of Christ in Sipsa, see: http://apantaortodoxias.blogspot.com/2011/11/blog-post_8910.html. 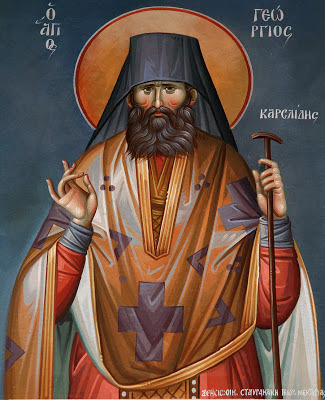 O river of Divine Grace, O God-bearing George, and vessel of miracles of all kinds, we praise him crying out, Ascension, Holy Monastery's Founder, and Drama's protector and shelterer, do not despise those who entreat you, and magnify you, O Righteous Father. Glory to Christ Who glorified you. Glory to Him who sanctified you, Glory to Him who showed forth this new ascetic fruitful. The image of God, was faithfully preserved in you, O Father. For you took up the Cross and followed Christ. By Your actions you taught us to look beyond the flesh for it passes, rather to be concerned about the soul which is immortal. Wherefore, O Holy George, your soul rejoices with the angels. Holy Father George, intercede for us!